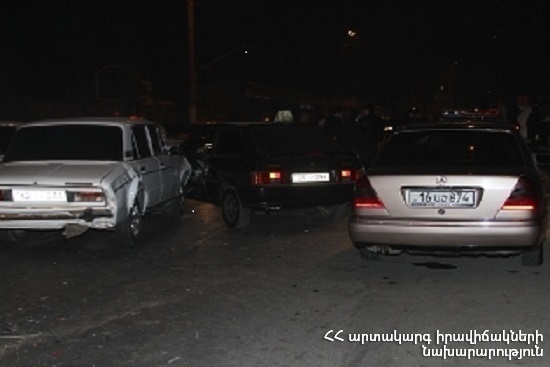 On April 15, at 23:53 an emergency call was received to “911” service that a car accident had occurred in Gevorg Chaush street, Yerevan: 6 cars had collided, there were citizens blocked inside а car, the rescuers’ help was needed. It turned out that “VAZ-2106”, “Honda CRV”, “Nissan Teana”, “GAZel”, “Toyota Camry” and “Mercedes C 6.3” cars had collided at the beginning of Ashtarak highway. Before the rescuers arrived at the scene the passenger (K. N. born in 1997) of “VAZ-2106” car had been taken out of the car by local forces. The rescuers took driver H. N. (born in 1979) out of the blockage and moved to the ambulance. The casualties were hospitalized to “Armenia” republican medical center with injuries of varying severity. According to doctors the casualties were in fair condition.